Since my brother's son had never been to Texas before, we decided that we had to make a day trip to San Antonio to check out the Alamo. As anyone who has been to the Alamo knows, it is a slightly underwhelming experience. We entered through the back due to our parking location and ate a quick picnic lunch in the Alamo gardens. We then headed to the front, and famous facade. Being a holiday weekend, there was a long line to get in. When we finally arrived, we walked inside the main building, checking out the various displays. But from previous visits, I have learned that a quick stop in the Long Barracks behind the Alamo helps to clarify the story a bit. The Daughters of the Republic show a fifteen minute documentary from the History Channel that gives a good overview of the importance of the battle in Texas history. I have also found that the diorama in the gift center is more entertaining and informative to the boys than the main building. 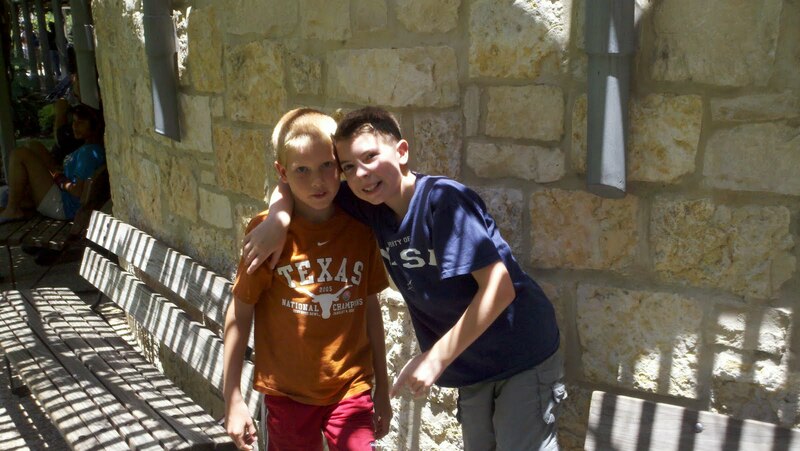 After our tour of the Alamo, we decided to walk the Riverwalk. For some reason, the boys did not want to take a boat ride, so we walked the entire circle. Along the way we stopped for dinner at an Irish pub. 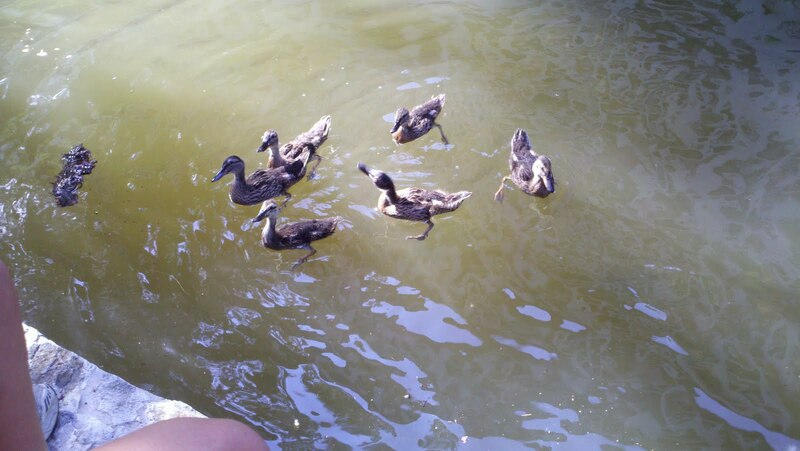 While eating, a small family of ducks came up. K collected the bread from his sandwich, and the boys merrily fed the ducks for awhile. After some more walking, we stopped for ice cream along the way. We made a game of waving at the various boat goers and couting the number of people who responded. Up in a tree we checked out a nesting Yellow Crested Egret. We also had to take a few rides along the glass elevator at the hotel by the entrace of the Riverwalk. After a full day, we walked back to our car and headed back to Austin! John and I enjoying the Irish pub!